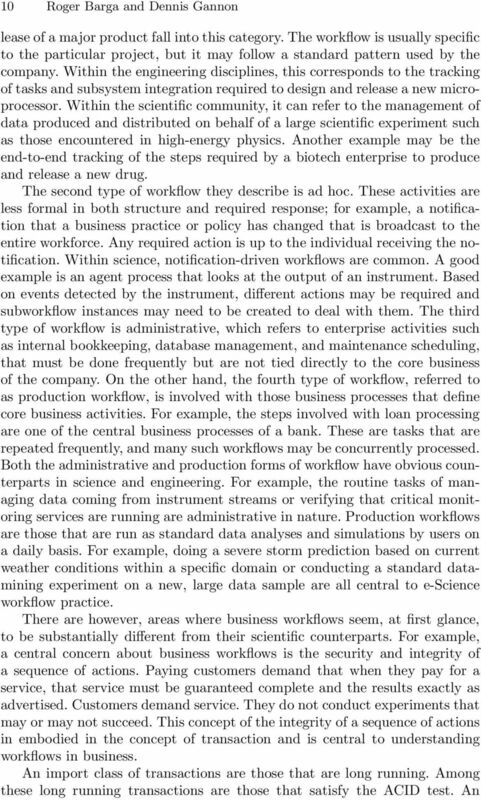 Download "Scientific versus Business Workflows"
6 14 Roger Barga and Dennis Gannon geographically dispersed and often exploit heterogeneous tools, compare data from different sources, and use machines distributed across several institutions throughout the world. And as the number of scientific resources available on the Internet increases, scientists will increasingly rely on Web technology to performin silico experiments. However, the task of running and coordinating a scientific application across several administrative domains remains extremely complex. 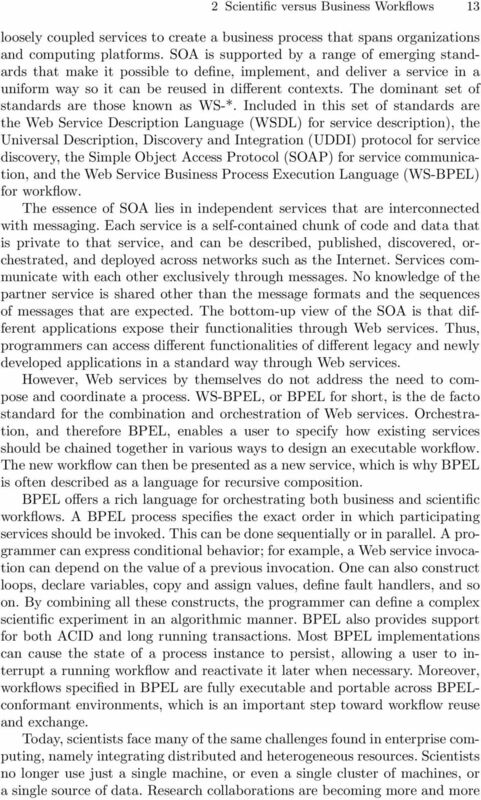 One reason BPEL is an attractive candidate for orchestrating scientific workflows is its strong support for Web services. With scientific resources now available as Web and Grid services, scientists can transition from copying and pasting data through a sequence of Web pages offering those resources to the creation and use of a workflow for experiment design, data analysis, and discovery. Many types of in silico genomics analyses, such as promoter identification, start with an initial set of data, perhaps acquired in a more mechanical way such as through fast sequencing equipment or from a microarray chip. This is followed by an ordered sequence of database queries, data transformations, and complex functional, statistical, and other analyses. Such work may require computing power ranging from a desktop computer to a remote supercomputer but is relatively loosely coupled and in many instances asynchronous. By defining a workflow to automatically invoke and analyze more routine parts of the process, multiple data sets can be processed in parallel without requiring a significant amount of additional effort from the scientist and can considerably increase productivity. With the proper tools, scientists with limited programming skills can use BPEL to construct a workflow that carries out an experiment or that retrieves data from remote data services. There are other advantages to be gained from adapting BPEL for scientific workflows. Since BPEL workflows are designed to act as a Web service, a workflow can be published as a Web service and easily combined with other Web services. Capturing an in silico experiment or data transformation as a reusable workflow that can be defined, published, and easily reused is essential in sharing scientific best practice. Using BPEL to orchestrate an experiment also enables fault tolerance. Because scientists are allowed to select and employ services from a UDDI registry into the workflow, they also have the ability to use an alternative service with similar functionality from the registry in case the original service fails. This ensures that no experiment terminates unexpectedly because of the failure of one particular service in the flow. Furthermore, a BPEL workflow is specified in terms of service invocations. This allows all aspects of the workflow, such as service execution, message flow, data and process management, fault handling, etc., to be specified as a single integrated process rather than handled separately. The result is a workflow in which each step is explicit, no longer buried in Java or C code. Since the workflow is described in a unified manner, it is much easier to comprehend, providing the opportunity to verify or modify an experiment. 7 2 Scientific versus Business Workflows 15 There is a clear case for the role of workflow technology in e-science; however, there are technical issues unique to science. Business workflows are typically less dynamic and evolving in nature. Scientific workflows tend to change more frequently and may involve very voluminous data translations. 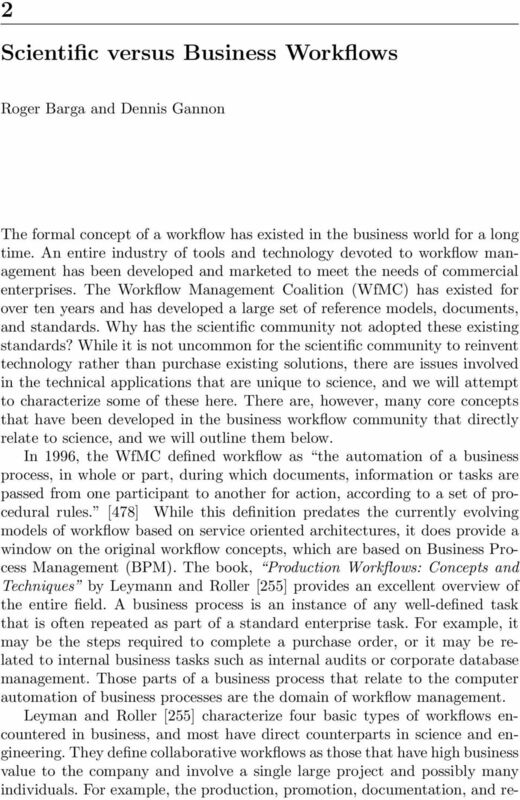 In addition, while business workflows tend to be constructed by professional software and business flow engineers, scientific workflows are often constructed by scientists themselves. While they are experts in their domains, they are not necessarily experts in information technology, the software, or the networking in which the tools and workflows operate. Therefore, the two cases may require considerably different interfaces and end-user robustness both during the construction stage of the workflows and during their execution. In composing a workflow, scientists often incorporate portions of existing workflows, making changes where necessary. Business workflow systems do not currently provide support for storing workflows in a repository and then later searching this repository during workflow composition. The degree of flexibility that scientists have in their work is usually much higher than in the business domain, where business processes are usually predefined and executed in a routine fashion. Scientific research is exploratory in nature. Scientists carry out experiments, often in a trial-and-error manner wherein they modify the steps of the task to be performed as the experiment proceeds. A scientist may decide to filter a data set coming from a measuring device. Even if such filtering was not originally planned, that is a perfectly acceptable option. The ability to run, pause, revise, and resume a workflow is not exposed in most business workflow systems. 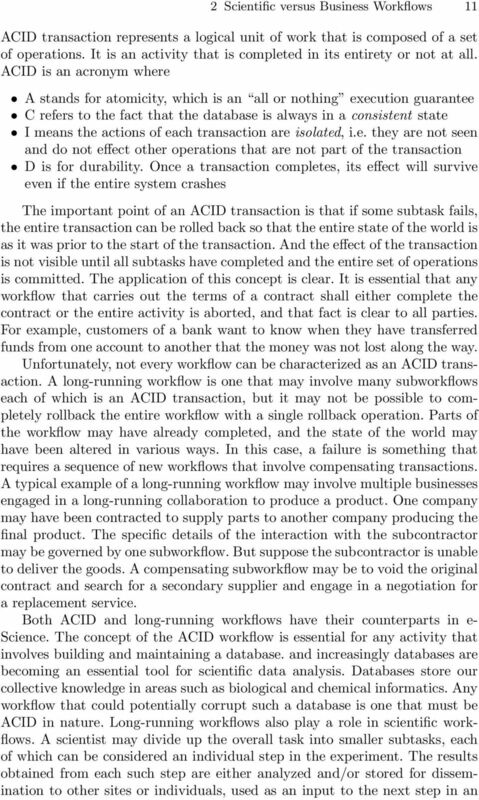 Finally, the control flow found in business workflows may not be expressive enough for highly concurrent workflows and data pipelines found in leadingedge simulation studies. 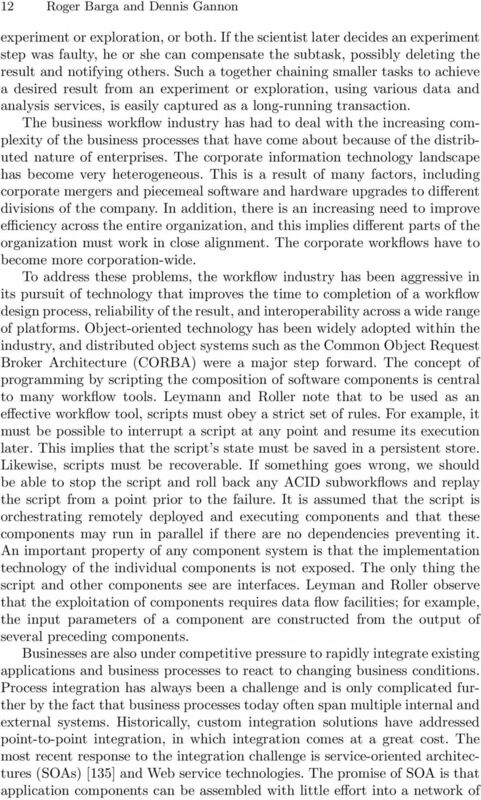 Current BPEL implementations, and indeed most business workflow languages, require the programmer to enumerate all concurrent flows. Scientific workflows may require a new control flow operator to succinctly capture concurrent execution and data flow. Over the last 20 years, there has been a great deal of interest in both research and industry in systematically defining, reasoning about, and enacting processes and workflows. 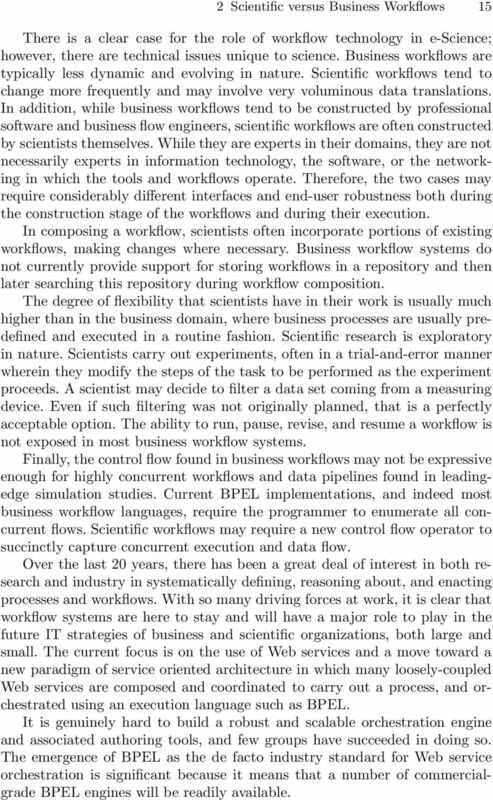 With so many driving forces at work, it is clear that workflow systems are here to stay and will have a major role to play in the future IT strategies of business and scientific organizations, both large and small. The current focus is on the use of Web services and a move toward a new paradigm of service oriented architecture in which many loosely-coupled Web services are composed and coordinated to carry out a process, and orchestrated using an execution language such as BPEL. It is genuinely hard to build a robust and scalable orchestration engine and associated authoring tools, and few groups have succeeded in doing so. The emergence of BPEL as the de facto industry standard for Web service orchestration is significant because it means that a number of commercialgrade BPEL engines will be readily available. 8 16 Roger Barga and Dennis Gannon The strength of BPEL for orchestrating scientific workflows is its strong support for seamless access to remote resources through Web services. As scientific applications and curated data collections are published as Web services, as will increasingly be the case with the emergence of service-based Grid infrastructures, commercial BPEL engines will be an attractive execution environment for scientific workflows. WHAT IS BPEL AND WHY IS IT SO IMPORTANT TO MY BUSINESS? Myths About Service-Oriented Architecture Demystifying SOA. producers can coexist, and still have no dependence on each other. What can DDS do for You? Learn how dynamic publish-subscribe messaging can improve the flexibility and scalability of your applications. Service-Oriented Architecture: Analysis, the Keys to Success! 10 Years of Hype Cycles - Do We Forget Knowledge?